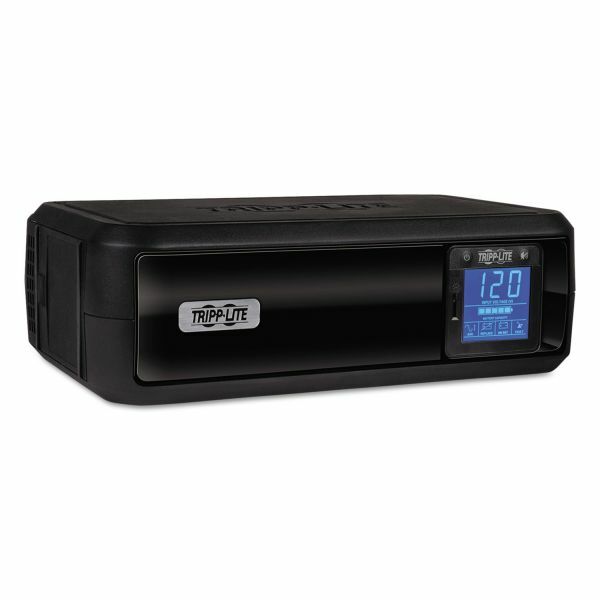 Tripp Lite SmartPro LCD Line-Interactive UPS AVR Tower, USB, 8 Outlets, 1000 VA, 1038 J - Line-Interactive Digital UPS System offers voltage regulation, surge suppression and battery support for personal computers, network workstations and more. 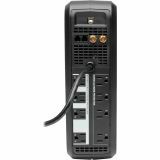 Internal UPS circuits support entry-level PCs for 60 minutes or individual VCR/DVR for 3 hours during power failure. AVR circuits regulate brownouts as low as 89 volts back to usable levels without using battery power. 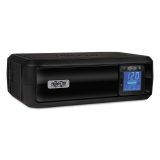 Includes 4 battery-supported outlets, plus 4 surge suppression-only outlets. USB port enables optional unattended system shutdown without data loss; cable included. HID-compliant USB interface enables integration with built-in power management and auto shutdown of Windows, Mac OS X and Linux. Built-in single-line RJ-11 phone suppression jacks protect modem and satellite receiver with standard dialup/DSL phone connection. 2.2 GHz coaxial jacks protect against surges on CATV, satellite or broadcast antenna connections. 3 minute battery runtime with full load of 1000VA/500W and 11 minutes with half load of 500VA/250W. Adapts to tower format or rack-mount shelf format.